UMA is a Spanish public University, with dynamic and innovative research in a wide range of scientific areas. Several research centres (Centre of Hydrogeology, European Topic Centre for Spatial Information and Analysis), and dedicated research groups contribute to the geospatial expertise in different fields of application and collaborate in their education and research on spatial information. The departments of geography, ecology and geology and economics offer a wide range of graduate and postgraduate programmes with a specific focus on geospatial topics. The establishment of the European Topic Centre for Spatial Information and Analysis in 2011, implied an important impact for geospatial activities in the University of Málaga. One subject will be offered in English: “Advanced Management of the production and quality in tourism businesses”. Post-Doc Thematic specialisation for supervision: Geography department: Rural development. Landscape research. Urban social micro-analysis. Natural risks and vulnerability. Touristic activities. Centre for Hydrogeology: Water recharge assessment in karst aquifers using GIS tools. Vulnerability mapping using GIS. Protection zoning in karst aquifers using GIS tools. Tourism department: Spatial planning and management of tourism. GI technologies applied to e-tourism. Touristic heritage. Generation and commercialization of touristic products. GIS applied to tourism. European Topic Centre for Spatial Information (ETC-SIA): (European) Land use assessment. GI data management and publication. Ecosystem Accounting and assessment. GI data analysis applied to urban topics. Remote sensing (biodiversity and wetlands). Data management at the land-sea interface. 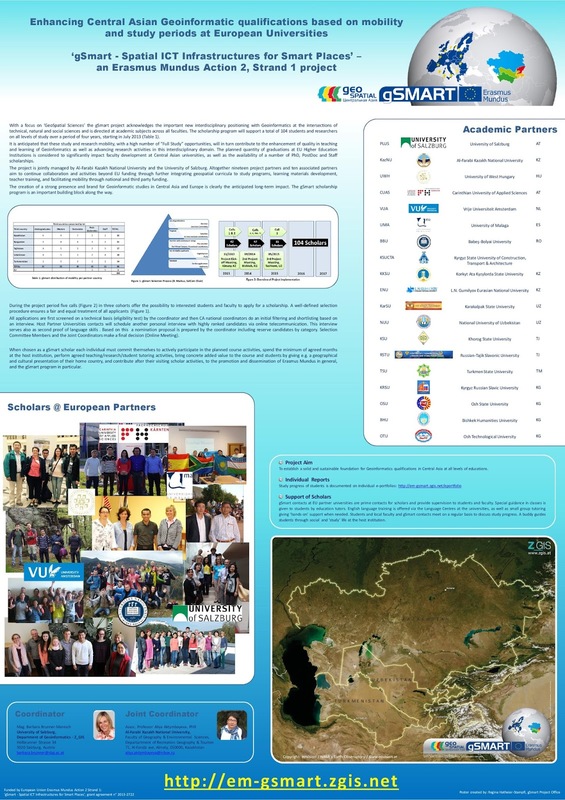 International training course and International Symposium (both in English) on water resources and environment in karst environments will be available on October 2014. Specific summer school courses (e.g. “EO-based biodiversity monitoring: From concepts to products”), availability depending on offer. - GIT applied to e-tourism (6 ects). - GIT applied to the management of tourism businesses (3 ects). - GIT applied to tourism (3ects). Internship at ETC-SIA which is composed of a group of 8 experts in GIS and Remote Sensing, applied to environmental, land related and urban topics. It offers possibilities for internships both in the framework of the mentioned master programmes and for staff and experts with an interest in the management and analysis of large dataset and assessments at small scales.